The Deal Card is a loyalty card scheme run for all independent businesses throughout Deal and Walmer. We aim to help grow the overall economy of the town by providing identity, clarity and unity. Compared to big businesses, the offerings of independent businesses can often be unclear and fragmented. Not in Deal and Walmer! Independent businesses amplify their existing identity by joining the scheme, and this adds to the town’s overall identity. They achieve economies of scale in marketing through www.DealCard.co and promotions. This brings clarity regarding the great deals and services they offer their customers. Deal High Street won the Daily Telegraph’s High Street of the Year award in 2014, but there are great businesses around the rest of the town too, not just in our unique Georgian and Victorian town centre. The Deal Card unites businesses throughout the town. Is it only for people in Deal? No, anyone anywhere in the world can obtain a Deal Card. However you can only use it to buy goods or services on offer from businesses in Deal and Walmer. This means it might be possible to live in New Zealand, register and be sent a card, and buy services from the participating online businesses based in Deal! Is the Deal Card an online shop like Amazon? We’re not an online shop and we don’t do online transactions. (That might be possible in the future). Actually we are like Amazon and other online sites insofar as we collect as much as possible of what is available and put it on our website for you to read, browse and compare. This is what is known as ‘aggregating’ goods and services. We are an aggregator site for all the offers on goods and services available in the town, and a directory of as many businesses as we can find! Get your starter card at multiple locations throughout the town, including businesses, the Astor Theatre, the Tourist Information, Deal library, railway station, cafés, pubs, hotels, guest-houses and many more. If you’re travelling from outside town to visit Deal, you can register for a card before you travel in time for one to be posted to you. Some travel providers such as coach companies also have stocks of the paper starter cards when they’re running tours to Deal. Can I just go to a business and ask for discounts on anything? No. Businesses make attractive offers to Deal Card holders and Deal Card holders are entitled to buy goods and services on offer from participating businesses as part of the scheme. This does not mean everything is on offer all the time. If you enquire, you might find the business is planning to offer what you want at a later stage. Why are there 2 types of card? There are 2 types of card: the paper starter card and the permanent registered card which is plastic. We want as many people as possible to use the cards so we make it as easy as possible to get free cards almost anywhere. These paper starter cards enable the card-holders to take advantage of some great offers immediately. We also offer a voluntary scheme whereby people can register for free, providing their email address and other information. In return they get a stylishly-designed permanent card in durable plastic the size of a credit card that fits easily into purses and wallets. When people register, they get the great offers as always, but they also benefit from lots of extra advantages too: not just the card; but regular news about offers, events and competitions. Can I just keep my paper starter card? Yes, you can keep your paper starter card as long as you like, or just use a new one when it gets frayed and dog-eared from use. We want as many people as possible to use the cards so we make it as easy as possible to get free cards almost anywhere. These paper starter cards enable the card-holders to take advantage of great offers immediately. What are the advantages of registering for a permanent card? In addition to the free paper starter card, we also offer a voluntary scheme whereby people can register for free. In return they get a stylishly-designed permanent card in durable plastic the size of a credit card that fits easily into purses and wallets. When people register, they get the great offers as always, but they also benefit from lots of extra advantages too: not just the card; but news about offers, events and competitions. If you lose your paper starter card, just grab another one and start using it immediately. If you have registered to receive a free permanent card and lost or damaged that, just get in touch and we’ll send you a replacement. The Deal Card scheme is absolutely free for the public. How do I find out what offers businesses are offering? • Online: Check our website and related social media regularly. You can browse the different businesses and see exactly what they’re offering. You’ll be surprised at the breadth of what’s on offer from businesses in Deal and Walmer. • Offline: See the Deal Card posters displayed in the windows and on the premises of businesses. Also look out for the monthly flyers that list some of the many offers. What types of business accept the scheme? All types of independent businesses are represented in the Deal Card scheme. Of course they include retailers (shops) and hospitality (cafes); but also many more services such as plumbers, builders, estate agents. Also eligible to participate in the scheme are online businesses offering services in Deal and Walmer, and local franchises of national chains. Where is the Deal Card based? The administrative functions of the Deal Card are run as part of Deal Arts Management CIC from The Astor Community Theatre in Stanhope Road, Deal, CT14 6AB. Can I use it in big stores? Many large stores operate a national policy of not accepting loyalty card schemes such as the Deal Card. Individual managers may choose to accept the card so it is worth enquiring in the store. Ultimately, our aims with this scheme are to support smaller independent businesses and give them a facility that is similar to the in-store loyalty card schemes operated by large chains. I live outside Deal but visit regularly. How can I get a card? 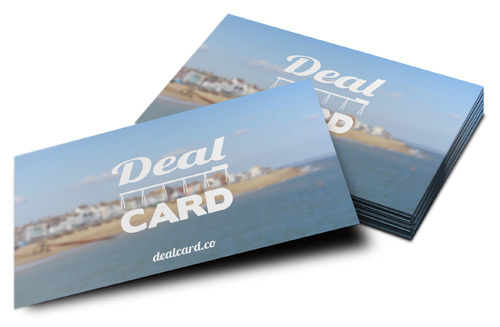 Grab a starter paper Deal Card next time you’re visiting Deal and Walmer. If you’d like to register via our website, we’ll post you a permanent plastic card directly. Just remember to bring it with you to benefit from great offers around the town. SECTION 2: DEAL CARD FAQ FOR PARTICIPATING BUSINESSES. Why are there 2 types of card for businesses? What happens if a member of the public with a Deal Card turns up and demands discounts on goods or services that I am not including in my offer? The offers you make are entirely at your discretion in order to benefit your business. Your offers are marketing flags to publicise your business. We make clear on our website and in our Terms & Conditions that the Deal Card only qualifies the holder for the offers made by participating businesses. You might decide to make a small offer and entice the customer to become a repeat visitor. After all, one of the Deal Card’s main aims is to have people spend more of their money in Deal more of the time. If the customer has been attracted to your business by the sign in the window or by reading your page on the website, then we would be delighted to have helped increase the footfall to your business. You would of course be within your rights to politely point out what the Deal Card entitles the holder to buy (and by implication what not) or what offers you’re planning in the future. Does my offer have to be a discount? No, although we use a 10% offer on certain lines at certain times as an example, your offer is at entirely at your discretion. This might mean BOGOF/BOGOHP or 3-for-2 or other types of promotion. It is important to emphasise that Deal Card offers are intended to help your business. You could just offer your existing promotions under the Deal Card umbrella. How often can I change my offer? You can update your page on the Deal Card website whenever you like. Simply log-in with your username and password and change your offer. Does my offer have to be on all my stock or services? No. Your offer might be on new lines, or end-of-stock, or seasonal or shoulder lines, whatever is most beneficial to your business. Remember, your offer is your marketing flag to attract people’s attention. Does my offer have to run every day? No, you can specify which day or days you would like your offer to be available. What are the benefits of the 2 different business memberships? See our business plans page for details. How do I change my offering and publicise my new offers? Simply log-in to the Deal Card website with your username and password and update your profile with your new offers. Can I give out Deal Cards on my premises? Yes, we can give you quantities of the starter paper Deal Card to give to customers. Just email us or call in and collect from the Astor Theatre (or borrow from a neighbouring business if they have any spare). I already have a loyalty card dispensed to a number of my customers, what would the benefit be to me to have the Deal Card instead/as well as? The Deal Card is a collective marketing scheme, helping participating businesses to benefit from economies of scale in the website, flyers, posters and social media. We set these up and maintain them so you don’t have to spend your time or money to do so. Your offer is your marketing flag to attract attention to your business. You can choose to run an additional scheme and website if you feel this is beneficial to your business. The Deal Card aims to ensure customers only have to look at a single website and only have to carry a single card throughout the town to qualify for offers. What do you propose the benefit to the customer to be? Card-holders can take advantage of the offers provided by participating businesses. They only have to carry a single card for all independent businesses throughout the town. They only have to look at a single website to check all the offers. They can discover offers by means of their mobile phones and computers via the website instead of having to walk past the shop or business. They can get a sense of pride in belonging to Deal and Walmer as a community and helping to sustain its economy by making purchases with independent businesses in the town. They can browse different categories and business pages on the website, and easily discover businesses they might not have walked past or used or know previously. They can benefit from the same experience they have with their supermarket loyalty card, but instead of walking around aisles in a superstore, they are walking around attractive streets in an historic town. Can I add specific photographs and text to my webpage? Yes, we actively encourage you to post photographs of yourself, your colleagues, your premises, your stock and your customers. We encourage you to write a few lines explaining your business. You can make it as personal as you like. Do the photographs just appear on the website? No, your photos will also appear on the Deal Card pages of other social media sites like Instagram and Pinterest, thereby amplifying your internet reach at no extra effort or cost to yourself. I don’t feel confident about updating my webpage on the Deal Card website. Can you do it for me? Yes. We can either give you a brief guidance session and overview at your business lasting about 15 minutes (£5 admin fee). If you really don’t want to do this yourself, just send your offers, photographs and text to us via email and we can do it (£5 admin fee for the first time and for any subsequent changes you would like). What happens if I lose or forget my log-in details or password? Just get in touch with us via the website or via email. How is the Deal Card scheme administered? Long-term plans are in place to share permanent resources and personnel between the Astor Community Theatre, 3Deal Ltd and other concerned stakeholders. This is not paid for by the scheme, but by pooling these resources from elsewhere. Because so much of the scheme is automated via the website or done by businesses maintaining their own profiles and webpages, the paid administration is currently set at half a day per week. Other stakeholders give their time on a voluntary basis. These arrangements are constantly under review. Yes there have been attempts at such schemes before in Deal and elsewhere. We feel that technology has improved so quickly and so remarkably that it now enables more innovative schemes to work at a lower cost than previously tried. We will keep trying in order to support the economic and social fabric of our community. Aren’t there lots of these loyalty-type schemes? Yes, there are lots of different types of scheme, such as card stamps, currencies and discount cards. They all have the generic name of ‘loyalty card’. Using an advanced tailored website and smart links to social media, we aim to produce a scheme based on a simple concept and using best practice. Aren’t these schemes expensive to set up? The largest cost is in producing a good website from the outset, one that is capable of being expanded at little extra cost in the future. The next largest cost is the printing of paper and plastic cards. We applied for and received grant funding to enable the scheme to proceed. Aren’t these schemes expensive to run? We have identified 4 major elements that together constitute the administration of this scheme. These are: card issuing; webpages and content; technical support for the website; database administration (businesses and individuals). This scheme is partially monetised thanks to the many supportive businesses who pay for Premium Membership (£60/year). Do these schemes actually work? During 2014 or 2015 we are working to introduce technology that will monitor where and how often registered plastic Deal Cards are used. This important information will provide a feedback loop to ourselves and participating businesses and enable businesses to target card-holders better with offers, just as larger chain-stores do with their loyalty schemes. Until then, and for usage of the starter paper cards, we are relying on evidence from participating businesses. Don’t schemes like this just reduce revenue? This scheme aims to bring the existing promotions offered by businesses under the same umbrella at no extra effort or cost to the business. Our overall aims are first to try to safeguard the existing businesses in the town, and then to try to grow the overall economy of the town by helping more people to spend more money more often in the town.